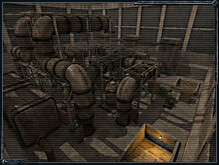 The map, called 'Industrial', is a compact location, designed for a team play of ideally 4x4, though technically allowing the usual up to 32 players online or over LAN. Once downloaded, the map files are to be extracted into the "mp" folder of S.T.A.L.K.E.R. : Clear Sky root directory (for instance "C:\Program Files\STALKER_Clear_Sky\mp"). Then you can play on the new map. Note: If you are creating the server, make sure you reboot your computer after extracting the map files. This benchmark is based on one of the ingame locations – Marshland. The testing process includes four stages, those utilizing various weather and time of the day settings (day, night, rain, bright sun). In order to test your system thoroughly the benchmark is provided with a number of presets and options including different versions of DirectX (9.0, 10.0, 10.1), screen resolutions, antialiasing etc, all at your disposal. Having your PC tested with S.T.A.L.K.E.R. : Clear Sky benchmark you will be able to get detailed information about its performance on various graphical modes and find out how well your system is balanced for gaming and S.T.A.L.K.E.R. : Clear Sky in particular. Download the official S.T.A.L.K.E.R. : Clear Sky benchmark (381 MB).